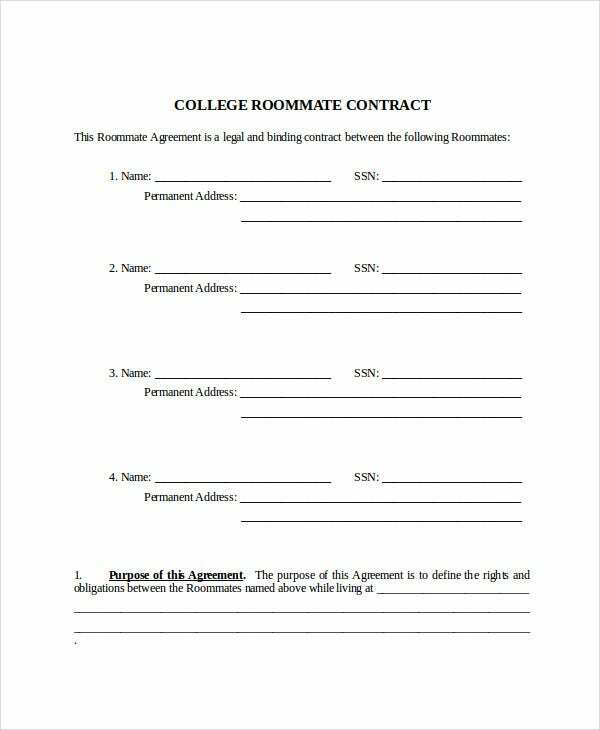 The roommate contract is a legally binding document, so you want to make sure your details are accurate and that you address all necessary situations. To help you determine those details, as well as to save you on drafting time, here are some free templates you can use. any other rules and restrictions pertaining to acceptable and unacceptable behavior (curfew, use of facilities, pets, noise levels, guests, etc.) that may be grounds for termination of the agreement. With that, it is important to remember a few key points about the arrangement. 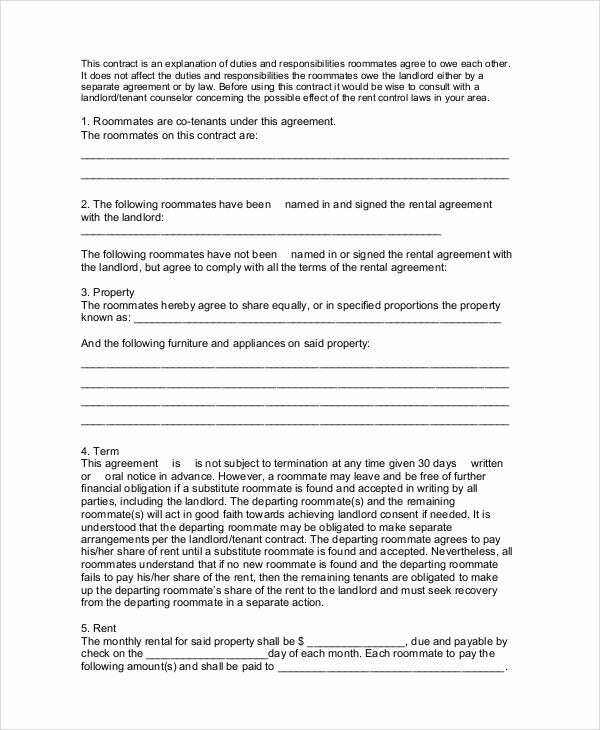 The roommate agreement is not the same kind of contract between a landlord and a tenant, although the landlord of a property can have multiple renters sharing the same unit sign a roommate contract among themselves. 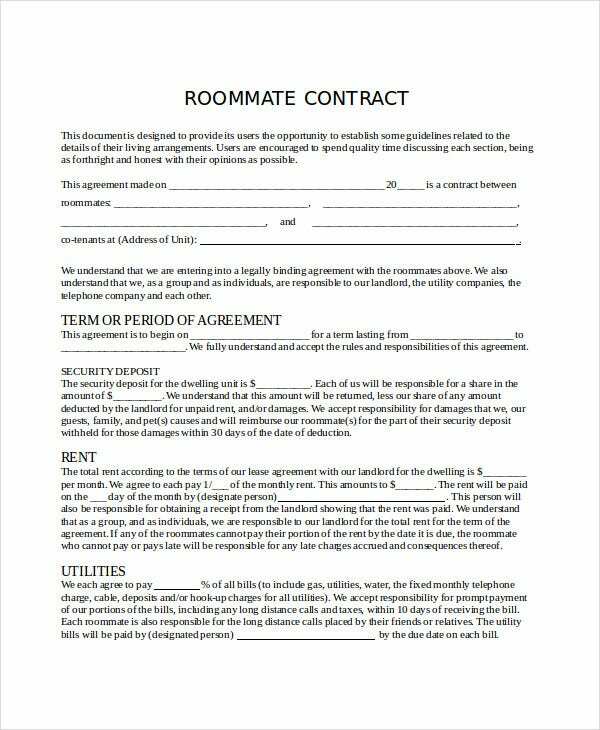 See Basic Roommate Contract Template. It is common that none of the roommates actually own the unit. There may be a situation where one roommate is the principal tenant signing a contract with the owner. Only the owner can thus sign a Renovation Contract or anything to do with the unit itself. The roommates are simply leasing the unit and may not have the right to renovate. 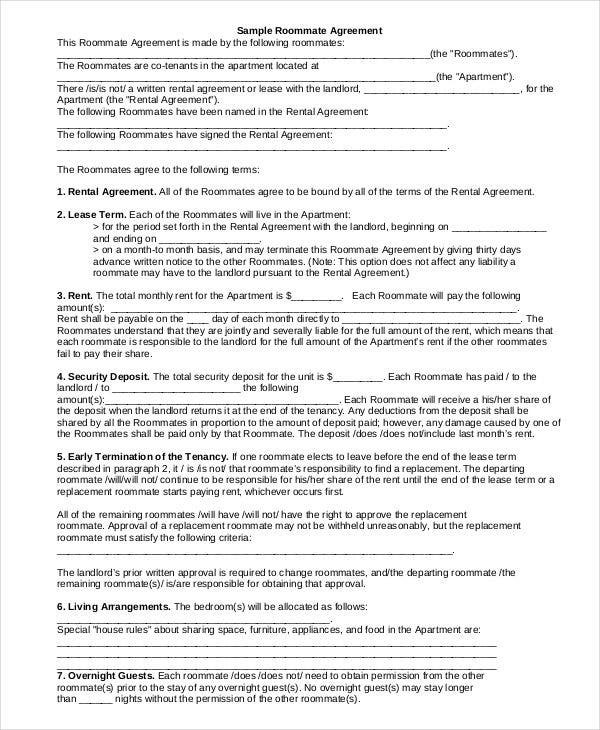 See Landlord Roommate Contract for the scope of a roommate’s rights. 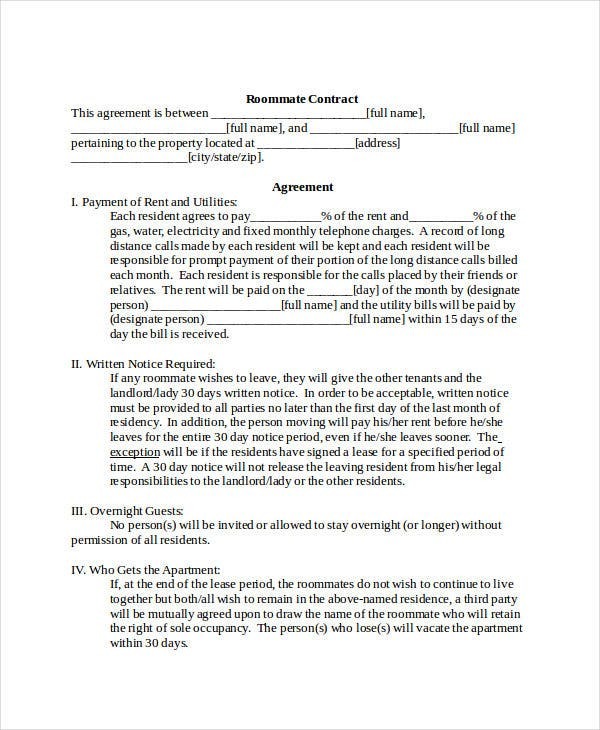 If you are going to be taking on several roommates, it is best to have all the roommates’ names on the same contract to be signed by all of them. 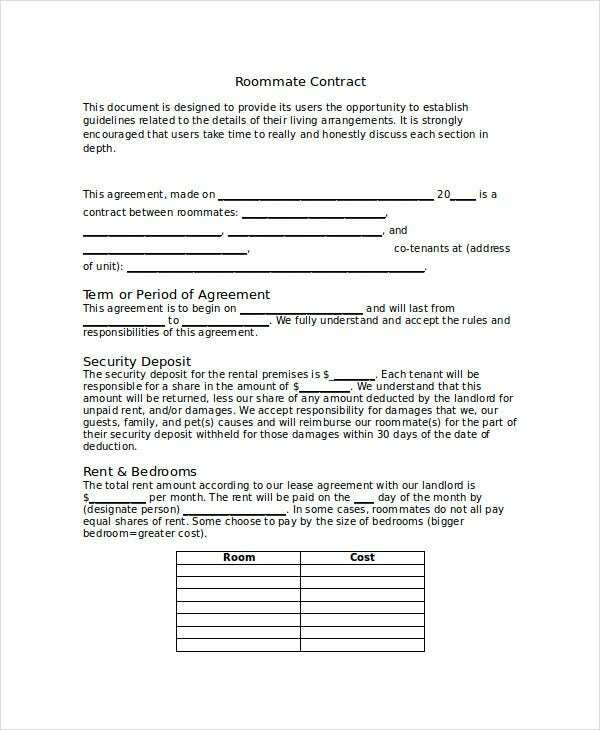 See College Roommate Contract Template for a useful example. 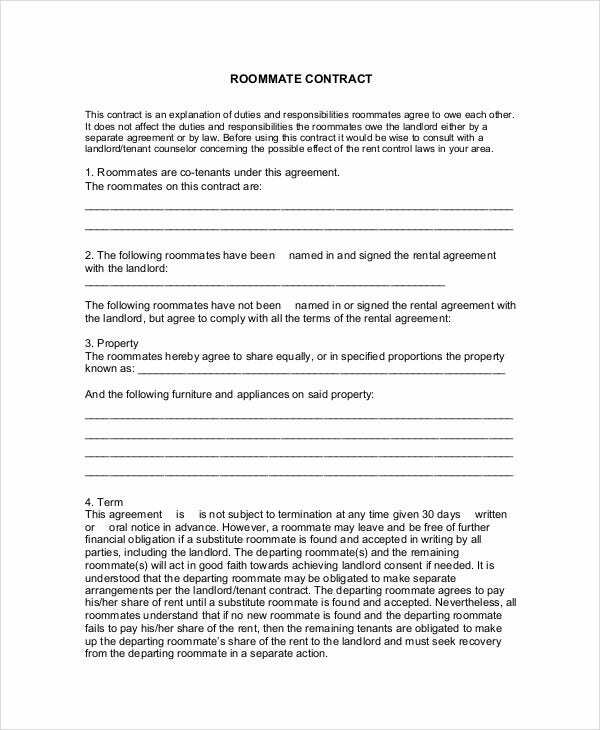 If you would rather have each applicant sign a separate contract, the New Roommate Contract Template will work. 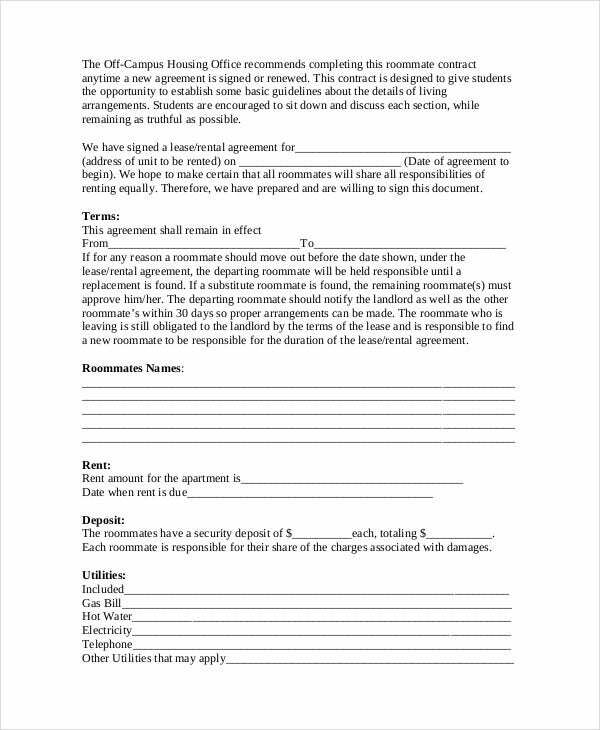 Note also that a roommate contract is used for residential spaces and not when two corporate entities decide to merge facilities and share commercial buildings. The terms in your partnership Business Contract will have to accommodate for this instead. 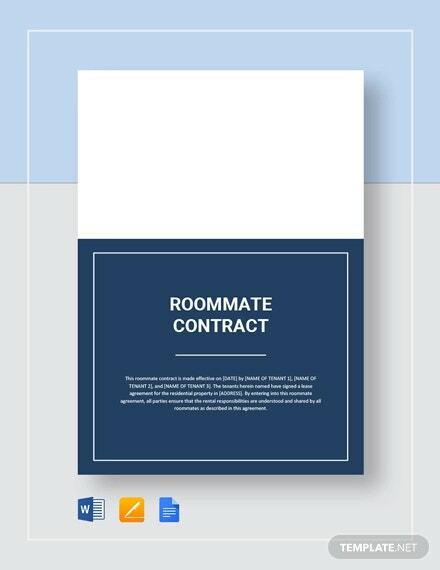 See Apartment Roommate Contract Template for the limits on what a roommate contract can accommodate. For residential situations, almost any of these documents can be tailored to fit your needs. Every rental situation will differ based on the property and the owner’s terms. 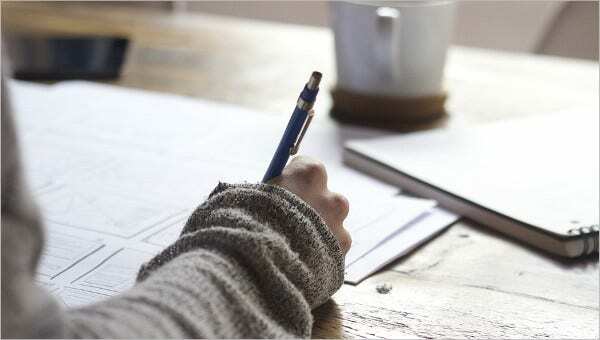 At best these roommate contracts will give you all the necessary details any small-scale Real Estate Contract should have. Because you can download them for free and edit them completely as Word documents, they should be flexible enough to serve most situations.